Pea soup is soup made, typically, from dried peas. It is, with variations, a part of the cuisine of many cultures. It is greyish-green or yellow in color depending on the regional variety of peas used; all are cultivars of Pisum sativum. As Finland was until 1809 part of the Swedish Realm, Sweden and Finland share many cultural traditions, including that of the pea soup (Swedish ärtsoppa; Finnish hernekeitto; Norwegian ertesuppe; Danish gule ærter), usually eaten on Thursdays, served with pork and mustard and accompanied by pancakes for dessert. However, in Finland it is made of green peas, in Sweden yellow. The tradition of eating pea soup and pancakes on Thursdays is said to originate in the pre-Reformation era, as preparation for fasting on Friday. Scandinavian pea soup normally includes pieces of pork – although it may sometimes be served on the side – and a typical recipe would also include some onion and herbs such as thyme and marjoram. It is usually eaten with some mustard, often accompanied by crisp bread and sometimes the sweet liquor punsch (served hot). Mustard is an important part of the dish, but the soup is served without it so that diners can stir it in to taste. The soup is then normally followed by pancakes with jam (strawberry, raspberry, blueberry, cloudberry or similar) which are regarded more as part of the meal than as a dessert. 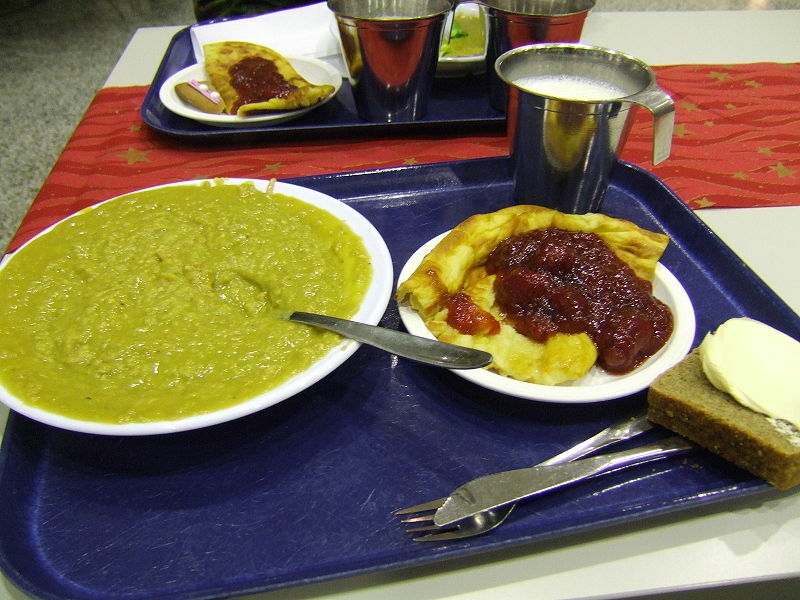 Pea soup with pancakes are served every Thursday (either for lunch or dinner) in the Swedish Armed Forces and the Finnish Defense Forces (a tradition dating back to World War II). Pea soup is also often served to large crowds in gatherings, simply because it is easy to make in large amounts and most people like it to some extent. Finns learn to eat pea soup as children, as it is a popular school food, being very cheap and easy to prepare. For other types of pea soup see Erwtensoep (Dutch pea soup) and Erbsensuppe (German pea soup).